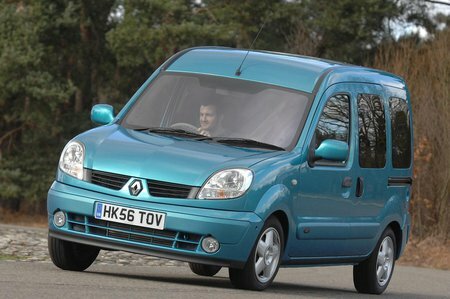 Used Renault Kangoo Review - 1999-2009 | What Car? What's the used Renault Kangoo estate like? The Renault Kangoo's huge cabin is light and airy, and even the tallest passengers shouldn't have complaints about the headroom. Legroom is good front and back, too, and the driving position is reasonably comfortable, even though there's no seat or steering wheel adjustment. Like other cars based on a commercial vehicle, though, there's no getting away from the fact that this is (as it's unkindly dismissed by some) a 'van with windows'. In some ways, that's good news. For a start, the rear sliding doors and a high-lifting tailgate mean access is easy from all sides. And, with the rear seats folded down, the cargo area extends to an impressive 2600 litres. However, equipment levels are less impressive, and the interior has a spartan feel, with rubber mats rather than the carpet offered by rivals. Once on the move, some road noise can be heard from inside, but otherwise refinement is good. Meanwhile, the ride is soft enough to cushion the effect of Britain's road surfaces, but the sift suspension does lead to a certain amount of roll through corners.